Ken Kaneki hardly wants to be involved in the dangerous secret ghoul societies of Tokyo, but recent events cause just that to happen. Following his face-off with the doves Mado and Amon, Kaneki finds himself the center of attention in the ghoul world. However, all this attention isn’t necessarily a positive thing as it brings him into contact with some less than savory characters, including the eccentric ‘gourmet’, Shuu Tsukiyama. 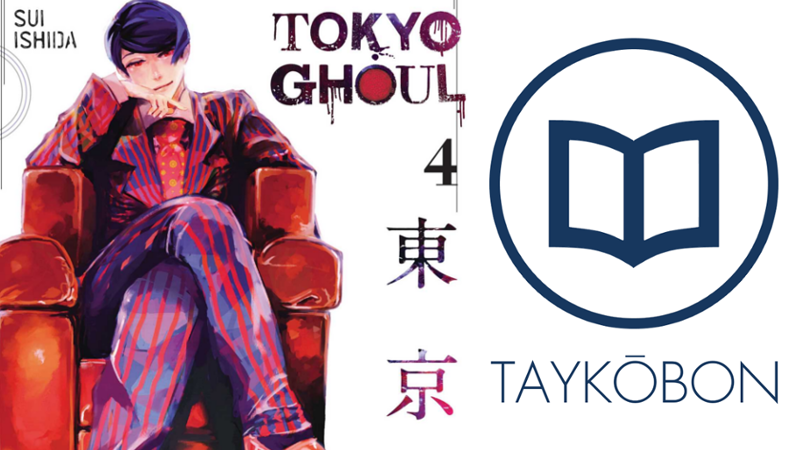 Tokyo Ghoul’s intense two-sided coin of a world has been subjected to quite a fast-paced and action-packed narrative thus far, but volume 4 takes a step back and slows down a bit for the sake of fleshing out interactions between different groups as well as to examine the effects of previous events on ghoul society. The most obvious example of this would be Rize’s death, the event that caused Kaneki to be involved in ghoul society in the first place. Rize’s death in and of itself is far more complicated than we imagined, as it is clear that it was no ‘accident’. Kaneki’s doctor also seems to be hiding something both because he performed the risky surgery under such strange conditions and seems to not notice what should be blatant changes in Kaneki’s body’s chemical composition. However, it’s the result of Rize’s death beyond just Kaneki that is so thought provoking: if Rize was essentially top ghoul and had almost absolute control over feeding grounds and other aspects of ghoul society, then her absence has created quite the power vacuum. This was made partially clear when Nishio was hunting in her territory, but was far more crucial than that: the ghoul feeding grounds, dove activity, and individual relationships with Rize all made her an important part of what is essentially the Tokyo ecosystem, and her absence has greatly shifted the balance of power both in and out of ghoul society. This complex relationship would be difficult to establish if the information on these different aspects wasn’t made more apparent, and that’s the key strength in this volume. The gourmet Tsukiyama, a ghoul obsessed with high society despite the irony of the bestial nature of a ghoul, had a relationship with Rize that was fiery because of their different ideologies. Rize, as a binge eater, consumed great amounts of humans in the most violent and outwardly repulsive way possible, while Tsukiyama chases after ‘high human society’ in his search for exquisite flavor and fine dining. Kaneki’s unique scent as a half human half ghoul causes him to take interest, and his role in the story will be clearly ongoing. Tsukiyama brings with him to the series an edge of creepiness that had previously diminished since the first volume as his obsession with Kaneki and his pursuit of human-like behavior in contrast with the actual actions of ghouls makes for disturbing moments, all of which feature darkly excellent illustrations. The different behaviors of different ghouls is the real focus of the volume as it looks at how events have effected individuals. Kaneki sees much of this, as while ghouls such as the deceased Rize and Tsukiyama are gruesome in their own special ways, others are decidedly less so in their own unique ways. Touka’s relationship with her friend, who is unaware that she is a ghoul, seems puzzling to many ghouls. Her friend loves to make food, and Touka eats all of it even though it puts her through absolute agony and weakens her daily. She does it because she values her friend though, not merely to keep up appearances, as if that were the case then she would just pretend to eat instead of actually doing so. In a similar yet difficult fashion, Nishio lives with a human girlfriend who knows that he is a ghoul, yet still cares for him. While it isn’t clear of the exact nature of their relationship yet, the idea of humans and ghouls consorting seems strange, even more strange than Touka’s relationship with her friend. Much like Tsukiyama, Nishio and Touka all have their different respective ways of integrating with human society, and the sheer substance of the difference between them augments the depth of Tokyo Ghoul’s narrative and helps differentiate the cast substantially from characters in what would normally on the surface appear to be similar in theme to the series. As I mentioned previously, the series slowed its break-neck pace from the previous volumes, and I think that it benefited all the more from it. This volume substantiated the personalities and attributes of many key characters, and while the focus is drawn away from the doves, it was good to explore the already existing characters and avoid the common trap of two-dimensional glorified plot devices that many casts in seinen and shounen series alike often fall into. Even Kaneki’s relationship with his friend Hide has its brief moment, as Hide has taken an interest in the recent ghoul investigations and his interest puts Kaneki at risk going forward much like his other ghoul friends are with their human relationships. That being said, some characters such as Hide are still fairly straight forward, and others such as Mr. Yoshimura are still veiled by the narrative and will likely be explored in greater depth in the future. Tokyo Ghoul’s fourth volume is a bit more of a slow burn than previous volumes, but is a great asset to the series’ storytelling. The exploration of ghoul society and the impact of individuals such as Rize allows for the narrative to delve into characters in more detail, and the intriguing results make for some excellent reading. If you are looking for more violent fights, then you will need to wait for the next volume, but the fights will be all the better for it with the added opportunities for readers to identify with the characters involved. However, if you are hoping for world building and character development, then you should be excited for this volume as it continues delivers excellently on both fronts. Tokyo Ghoul began serializing in Shueisha’s Weekly Young Jump imprint in September of 2011 and concluded at the same time in 2014. A sequel manga named Tokyo Ghoul Re: is currently being serialized, and the original manga received an adaptation by Studio Pierrot in Summer 2014 and a second season in Winter 2015. VIZ Media publishes Tokyo Ghoul in North America, and released the fourth volume on December 15th 2015 with a planned release of the fifth volume in English for February 16th.